That’s the message from some of the Phillies biggest stars in a bold new video posted to YouTube and the group specifically being supported by the Phightins could raise some eyebrows. 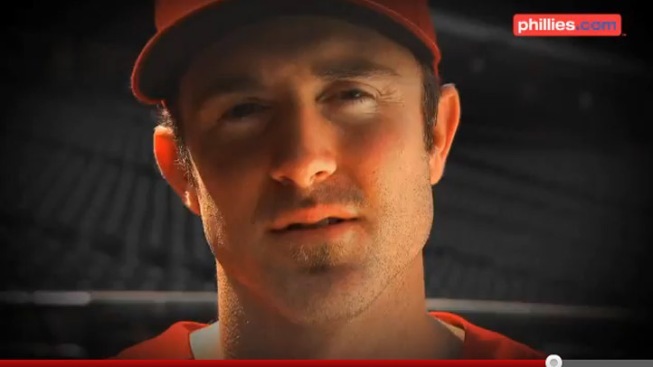 “The Philadelphia Phillies are proud to join ItGetsBetter.org,” says Chase Utley. “…to let all LGBT young people know that life gets better,” adds Roy Halladay. The video, which was posted by MLB.com on Saturday, also features Phillies trade-deadline sensation Hunter Pence and young stars John Mayberry, Jr. and Michael Stutes. “The Phillies have joined the "It Gets Better Project" to inspire hope in young people that may be struggling,” says the video description. Looks like Doc and his teammates want to see bullying remain on the diamond -- where they have bullied the National League all season long -- and out of schools and playgrounds. “There is nothing easy about being young, about being yourself, about being an individual -- everyday brings changes challenges and emotions that helps define who you are,” say Halladay, Utley, Pence, Mayberry and Stutes (in that order). The video comes on the heels of a petition campaign by lifelong Phillies fan Jerome Hunt who was hoping the Phillies organization would stand up against bullying. ”We thought it was a worthwhile cause,” Phillies spokeswoman Bonnie Clark told Philly Gossip’s Dan Gross. The stand to support LGBT young people has come as both a breath of fresh air and served as a lightning rod for detractors -- something evidence by the at times flat out nasty comments being made on the video. But the Phillies’ stand on the issue is clear. “We promise it gets better,” says a genuine-sounding Utley. It honestly comes as a breath of fresh air that professional athletes -- especially huge names like Utley and Halladay -- were willing to stick up for what they think is right. Hopefully this is just the latest step in bringing tolerance to the traditionally homophobic world of pro sports while giving hope to kids going through a tough time.